Finally we begin working with the materials! Yay! 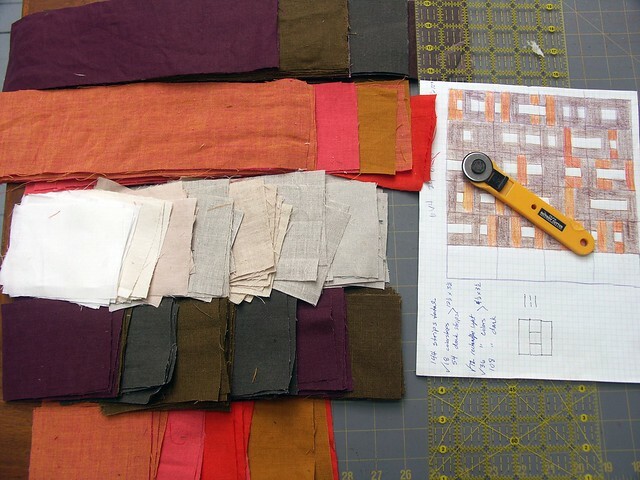 There HAS been a lot of prep work for the I Ching Modern quilt-along. I appreciate your patience! Since the last post on TRANSLATING, I hope you have decided on the form or pattern for your I Ching blocks. 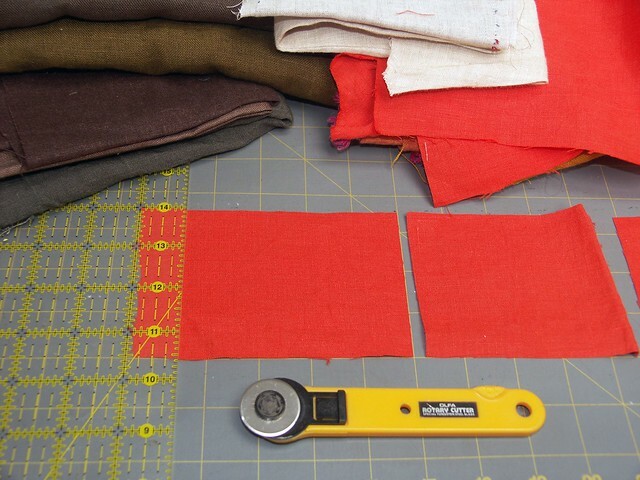 In order to immerse myself in randomness I have decided to pre-cut all the shapes I need for my I Ching Modern Quilt. The shapes will then be pulled blindly as needed, according to whatever hexagram I throw that day. If you want to use the same form I'm using for translating your hexagrams then follow the specific instructions below. If you've created your own pattern then figure out the shapes needed in each color way and start cutting your fabric accordingly. I'm making my I Ching blocks from strips and rectangles. Each block will be 12" wide and 18" long. Six lines or strips compose the length of the block. So 18" divided into 6 parts = 3". Remember to add a 1/4" seam allowance for each seam. Therefore I am cutting 12 1/2" x 3 1/2" strips from my dark neutrals and from my bright colors. 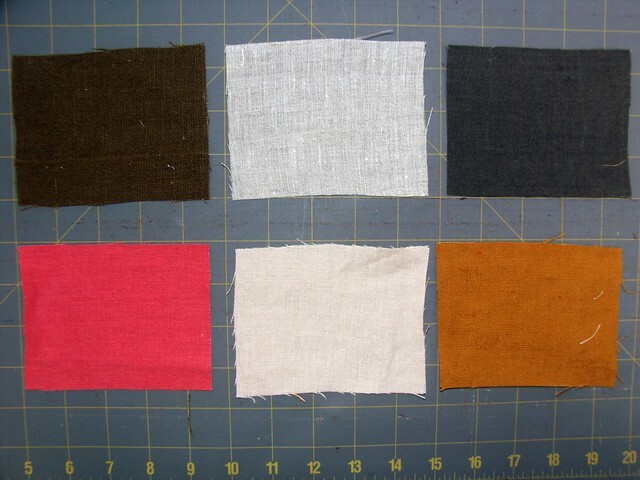 Put each color-way of strips into their own paper bag. I am using dark-neutrals strips for the solid yang unchanging lines. I am using bright-colored strips for the solid yang changing lines. The broken yin lines contain three sections. So 12" divided by 3 parts = 4". 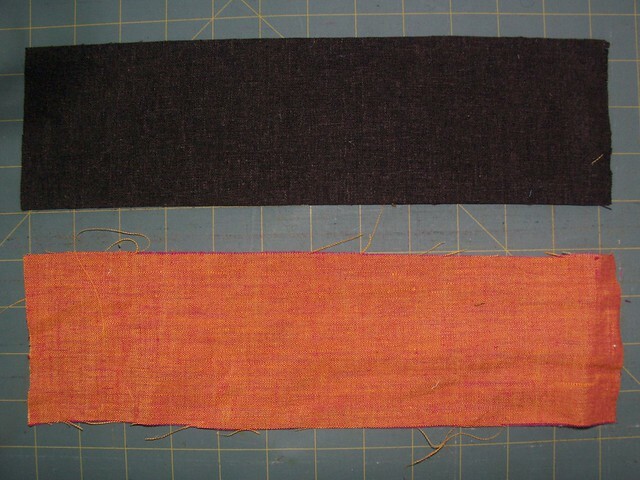 After adding my 1/4" seam allowance on each side, I am cutting 4 1/2" x 3 1/2" rectangles in all three color-ways. Place each color-way of rectangles in their own paper bag. I am making the broken yin unchanging line with two dark-neutral rectangles and a light-neutral rectangle in the center. I am making the broken yin changing line with of two bright-colored rectangles and a light neutral center. I will need 20 I Ching Modern blocks to make a large square sized quilt, 60" x 72". There's a 50/50 chance to throw either a solid or broken line. 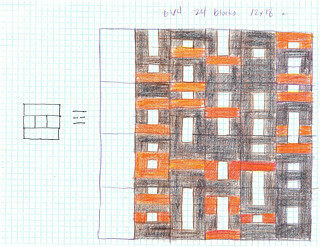 If I need 20 blocks with 6 lines each that's 120 lines or strips. Half will be YANG solid (60), and a quarter of that half will be changing (15). So I will cut approx 15 strips from my bright colors, and 45 strips from my dark neutrals. Half the strips will be YIN broken and will have the same chance of occurring as above. So I will cut 60 rectangles from my light neutrals, 30 rectangles from my bright colors, and 90 rectangles from my dark neutrals. 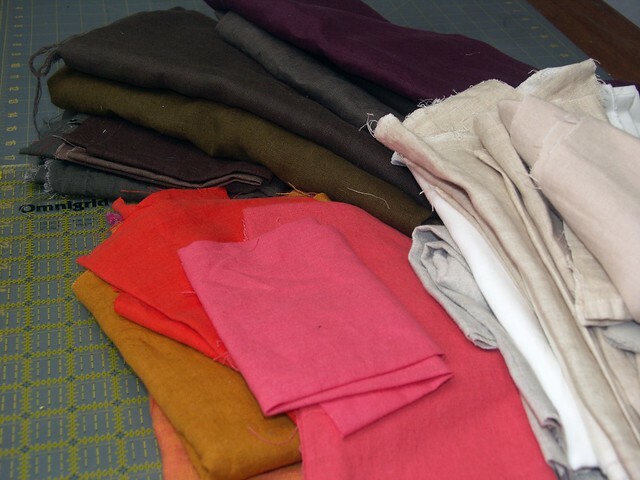 Approximate yardage: 3 yards dark neutrals, 1 yard brights, 1 yard light neutrals - plus a 1/4 yard extra of all color ways. It will be interesting to see how close the outcome matches the probability! It is likely that the real ratios will be off. In that case I will cut more shapes as needed at the end of the process. If you've already thrown a series of hexagrams go ahead and sew together several of your blocks in one sitting. From there sew a block when you ask the oracle a new question about your creative process and cast a new hexagram. Next week I will illustrate the entire process of ASKING the oracle, CASTING the coins, READING the oracle's response, and SEWING the block. Leave a comment if you are participating in the quilt-along. Also post any questions you might have. I've set up an I Ching Modern Flickr Group if you want to post images of your sketches, process, and final results.